The book “One Small Step Can Change Your Life: The Kaizen Way” has some great insights on why we resist change and how thinking a large goal or a problem in terms of smaller units will lead us to achieve those goals. The theme of the book is that when we think of some goal that’s big as a whole entity, it induces fear, which in-turn triggers flight or fight response in our brain. The flight or fight response blocks access to cortex, the creative part of brain thereby stop us from marching towards our goal. I feel that understanding the brain from evolutionary standpoint, as discussed in the book, will help those of us in the creative field to be creative. Over the course of human evolution, brain size have tripled. The modern human brain is the largest and most complex of any living primates which occupies 2% of body mass and consumes 20% of energy. 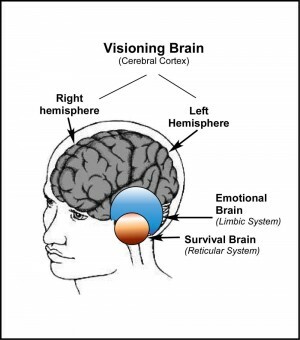 The evolutionary brain has three parts which which evolved during different periods. At the bottom of the brain is the brain stem. It’s about five hundred million years old and is called the reptilian brain(and in fact it does look like an alligator’s whole brain). The reptilian brain wakes you up in the morning, sends you off to sleep at night, and reminds your heart to beat. Sitting on top of the brain stem is the midbrain, also known as the mammalian brain. Roughly three hundred million years old, this is the brain possessed in one form or another by all mammals. The midbrain regulates the body’s internal temperature, houses our emotions, and governs the fight-or-flight response that keeps us alive in the face of danger. The third part of the brain is the cortex, which began to develop about one hundred million years ago. The cortex, which wraps around the rest of the brain, is responsible for the miracle of being human. Civilization, art, science, and music all reside there. It’s where our rational thoughts andcreative impulses take place. Amygdala is a structure that is present in the mid brain. This structure is absolutely crucial for our survival as it controls the fight or flight response. When we face an immediate danger, amygdala alerts parts of our body for action. One way it accomplishes this is by slowing down or stopping other functions such as rational thinking that could interfere with physical ability to run or fight. Imagine you are in a forest, when a lion charges at you, the brain does not want you to waste time carefully thinking through the problem. Instead, the brain simply shuts down nonessential functions, such as thoughts and process, digestion and sends signals to the body to immediately act. This flight or fight response is still vital today, for example to escape a fire in a building. When the brain senses the danger, it doesn’t wait for you to think about the next move. It commands the organs to respond instantly, in this case it triggers the flight mode. One can safely assume that the prerequisite for creative thinking is to not evoke the fight or flight response in our brain which will prevent access to cortex, the creative part of the brain. Our midbrain constantly scans for things around us that can cause danger to our life. Whenever we want to make a departure from our usual, safe routines, it sets off alarm bells. The brain is designed so that any new challenge or opportunity or desire triggers some degree of fear. It might have been useful for the survival of our ancestors, but this produces unwanted effects in modern life. Whether the challenge is a new job or a meeting with a new person, the amygdala alert parts of the body to prepare for action, it blocks access to the cortex, the creative and thinking part of the brain. Stress, nervousness, anxiety, loss – Underneath all, there is fear. The kaizen way of overcoming fear is to think the large goal in terms of small steps. Attempting to reach goals through radical or revolutionary means might often fail because they create fear. But the small steps disarm the brain’s fear response, stimulating rational thought and creative play. Ask Small Question. Have Small Thoughts.Think Small Actions. While solving an engineering problem, instead of thinking the problem as a whole, one can visualize it in terms of small steps. The great minds were able to get around the fear by turning fear into excitement or challenge, some gaze at fear unblinkingly. “Everyone who is running somethings go home at night and wrestles with the same fear: Am I going to be the one who blows this place up?”. Acknowledging the uncertainty may also be help one to overcome fear. Instead of treating fear as surprise, by expecting fear, we can approach it in a compassionate manner. Richard Feynman, an influential theoretical physicist and a Nobel laureate loved uncertainty and trained his mind to be perpetually curious. Thomas Edison treated each failure as a step closer towards success. When a reporter asked, “How did it feel to fail 1,000 times?” Edison replied, “I didn’t fail 1,000 times. The light bulb was an invention with 1,000 steps. Csikszentmihalyi, defines the state into 8 categorizes in terms of challenge level and skill level. The flow state is the one that generates the most happiness in life. In order to enter into the flow state those challenges must be met with an equal measure of skill. The higher the challenge and skill levels, the greater the flow, the greater the happiness. From evolutionary brain standpoint, we can visualize flow as a state of no emotions and no fear, a perfect state that will grab total access to cortex, the creative part of brain. We all experience this state of mind from time to time. But attaining the state can be quite rare because there are many barriers to freeing our minds. Csikszentmihalyi identifies negative forms of perfectionism, fear, self-doubt and self-censoring as primary obstacles to flow. There are several major improvisation principles. One is that you should “accept every offer.” So, for example, if two people were performing an improvised skit, Bob must say to Sherry, “I was thinking we could watch Silence of the Lambs tonight”. To which sherry would accept that offer by saying something like. “Yes, and we can still have time to watch the Late Show afterward.” To which Bob might reply, “Yes, and then we can check email!” It simplified and somewhat simple example, but the point of accepting every offer is that nothing is too silly. Accepting every offer by using “yes… and” language, a corner stone of improvisation, facilitates building up ideas. After all, if Sherry had spurned Bob’s initial offer by re-plying, “Thats a stupid movie,” Bob would start thinking and censoring himself, shutting down the possibilities that might come. That Bob and Sherry lift one another up relates to another foundation of improvisation. Make your partner look good. Because Bob and Sherry aren’t criticizing one another, it creates a positive atmosphere to generate possibilities. Positive energy drives improvisation, and reduces inhibitions and doubts. They are in the moment, and actively listening to each other, so that they can’t be planning what they are going to say next. They have to actively listening to each other. Throughout the Pixar creative process, they relay heavily on what they call plussing; it is likely the most-used concept around the company. The point of plussing is to build upon and improve ideas without using judgmental language. Creating an atmosphere where ideas are constantly being plussed, while maintaining a sense of humor and playfulness, is the central element of Pixar’s magic. The practice of plussing draws upon those core principle from improvisation: accepting every offer and making your partner look good. Rather than criticize and idea in its entirety (even if they don’t think it’s good), people accept the starting point before suggesting improvements. I’m yet to read “Creativity Inc” which might cover these techniques in detail. Research about creativity mostly narrows to nature and nurture. The “fight or flight” response and the evolutionary design of the brain may explain the basic condition that enables creativity.